Any one who had a chance to read article titled “Einstein and Newton: Genius Compared (The two scientific giants were alike in intellect and temperament)” by Alan Lightman published in September reaches the conclusion that the world we are living in is undergoing very fundamental changes. These changes are manifesting every where: in businesses, politics, technology, and society. On account of these changes, new winners (and losers) are coming up -- whether in terms of countries, or companies, or societies or even individuals. Technologically, some new developments are now on the horizon of making a way out of hypotheses to commercial applications within the next decade or so, perhaps fundamentally changing the way we conduct our business and the way we live. As far Pakistan is concerned, the changes are even more pronounced, be it in our demographics, education level, urbanization, access to information, economics and societal ambitions, or a desire to compete with the rest of the world. It is becoming increasingly tricky to predict the impact of such changes on corporate world. Each time any effort is made using typical methods and then applying those traditional models, the result is that the situation changes faster. What is the point here? Essentially, it is to suggest that today’s businesses need graduates equipped with current knowledge even if not more Einsteins than Newtons. That can be produced in universities teaching what is relevant to the future. MBA and MSc programs in the Lahore School of Economics are a case in point. See what are some of the challenges? Basic challenge is to predict consumer behavior, and consumers’ perception of value. Particularly so when the impact of advances in communication, in computing power, in our day to day life has fundamentally altered the way people buy and consume goods and services. Modern-day business needs graduates who can develop new postulates and invent new hypotheses and logic systems on how the consumers and the business environment would behave under these changes. Given the programs in the Lahore School, graduates are being geared to do just that. Of course, this is easier said than done. At the very least, on the other hands, corporate Pakistan should create an internal environment that allows challenging conventional wisdom, and encourages highly lateral thinking for hypotheses generation. The CEOs and owners should redefine their existing understanding of what businesses they are currently in, and would like to be in the future, which market they should focus on, which competitor would challenge them. Marketers should think beyond conventional markets and methods, to name just a few. Can this all be done? Probably it can be. The professional growth and progress of the Lahore School graduates that comes back is testimony to it. Apple has launched a weblog for students to hear from their peers about their observations and Mac-related stuff. The blog - the first for the company - is expected to include PC usages as well. Blog is introducing student bloggers as well. Stay tuned! In a recent survey, I was asked this question: What aspect of a job applicant with an MBA is most important -- the quality of the educational institution where it was awarded, the specialization, the motivation shown to have achieved a degree, or the applicant's personal attributes regardless of the course attended? I rated the educational institution and personal attributes the most important, followed by specialization and motivation. Let me justify my answer: Essentially employers in forward looking organizations growing with time are looking for top-level staff who have personal attributes that fit the criteria of doing a good job; attributes come from the years spent in educational institutions. A positive attitude towards achieving success in the job and good communication and interpersonal skills that top the list of most job interviewers' pre-requisites across all disciplines are learnt in the school from where one gets the degree. Specialization and motivation will follow. This raises the question about students' choice of courses. The best students are those who have identified in which university they want to study, what course, and how it can help them advance their career. For one student, MBA might well be the right path to follow. Those whose ambition is for general management organization should do so. "The MBA is a generic management programmed which provides practicing managers with an opportunity for personal development with a broadly-based introduction to all management subject areas and the theory and practice of management," writes Carol Blackman, a management guru. But an MBA is not the only choice for an advanced business education. Economics can be studied as MSc. This may lead down a more specialist, professional route of qualification, which is in demand from employers. Though MBA degree with economics, finance or accounting remains one of the most popular postgraduate qualifications. Beware, from where one gets the degree is one of the most important factors of all. Students need some place to come together, some place to have shared experiences, some place to congregate. At the Lahore School you can notice at all while walking from a dorm to your classes or from the main gate to auditoriums. More facilities are coming up all the time. Lahore School is not just a category “A” university in the country -- it is a collection of highly specialized and valued programs. The School has an unparalleled Main Campus -- campus walkways, auditoriums, administrative cottages, and the sports complex are all close to each other. Have a closer look and you find that the School has taken a closer look at how it can build educational community through geography. Spaces where students meet socially, like the café or the gym, create more social coherence. If one stays with the same group of students for the duration of the whole course, it is like selling the experience short. There could be someone very, very interesting in the next class, or in the junior class. Students who are involved in fraternities and societies have a stronger connection to the University and a better experience for practical life. Involvement at the University is like a small reminder of practical life. And while the University does many things to help students to get involved while on the Campuses, every one agrees that the best way is this: But students have to take the initiative to widen their own fraternities, they have to get involved in the School societies. 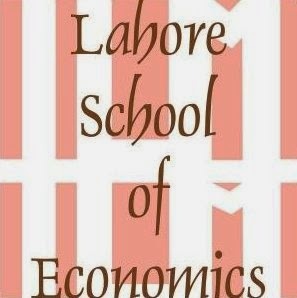 Federal government has declared the Lahore School of Economics as a Category “A” University. Higher Education Commission has certified that the Lahore School meets the criteria as laid down by the Federal Government. This decision is based upon the education system in the Lahore School that is more relevant to the real life, needs and aspirations of the nation, qualitative improvement of education to respond to an expanding market economy and quantitative expansion based on the manpower needs, with a direction on equalization of educational opportunities. Job market scouting reveals that employment opportunities open up to those who have degrees from the Lahore School. “Studying in the Lahore School is the perfect way to launch your career,” says Mobashir Ahmad, MBA – 1999, now working as Galadari Sales Executive in USA. Students consider many things when they choose a college major, such as their personal interests, the strength of programs offered, and their own talents and abilities, future employment prospects. Reputation of the educational institution also factor into the decision. When making a decision or considering your career track, it's natural to wonder what various degrees are worth. One measure of the value of a degree is the average jobs offered to new graduates of a particular educational institution. One has to consider many factors: starting salaries, long-term professional development, career satisfaction and some more. If you have an enriching educational experience at your school, you are more likely to succeed at your job. This could lead to faster advancement in your career even in a tight job market like ours. We live in times unlike any we have seen in the past. The international (as well national) forces (economies, markets, global competition) at work today have altered the basic premise of higher education's place in society and because of their gradual nature over the last years. These forces have now converged into a strong and steady perfect storm, leaving in its path a new reality nobody dares ignore – students, educators. As educators, the opportunity to instill in students something that transcends their career goals they bring with them to the Lahore School, trying to infuse a sense of the real importance of education in society and a love of learning for learning's sake-learning and for the sheer joy of knowing and preparing them in the way students approach new information and new intellectual opportunities is one thing. As students, the desire to be in the know of the situation and to follow the changes in another. That is what will bring lasting gift of success to them in the future. That is what will allow them to plan and manage change, rather than allow change to manage them. Students who undergo rigorous, vibrant, and attuned to the goal of learning experiences in the Lahore School build the capacity to be responsive to change in its environment. The Lahore School’s programs inspire students, the next generation of leaders, to achieve. In a world that runs on intelligence, the links between business and academia are inevitably growing closer than ever. Industry needs qualified people who can exploit the investment. Through academic Initiatives, the Lahore School of Economics is continuing to ensure that industries have the qualified people they need. Recently the Lahore School approached 350 top companies for getting their reports. Companies responded positively and some 120 companies have already sent their data and also put the school on their mailing list for updates. This is only one case in point. Student now will be able to carry out financial analysis for their projects. What is more, within the academic setting, the School puts students in direct contact with industry, business managers and experts in different fields in more than one ways. Through this network, students can apply what they are learning in the real world. The initiative also feeds ideas back into the learning cycle, ensuring that curricula remain current, relevant and interesting. Students who get hands-on experience enter the world of business with a huge competitive advantage. We aim at good and professional education for our students, which prepare them for both research work and business activity. Which is one reason why Lahore School of Economics prides itself on graduates who go on to become successful leaders of top companies. 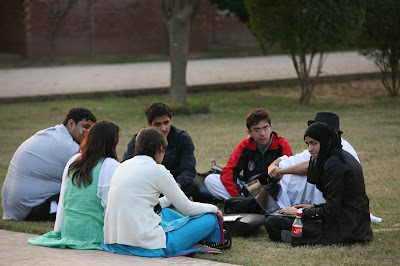 Lahore School of Economics is one of the most technologically connected institutions in Lahore. Scouting reveals both the City and Main Campus as technologically most connected campuses. The personal survey results were determined by asking students and teachers at different colleges in Lahore about the technological sophistication of their campuses. Questions included whether the college has own connectivity syatem, the ratio of school owned computers to students, frequency of usage of multimedia in the classrooms and access to the Internet in computer laboratories, libraries and residential blocks. Information technology people all over the Lahore School work very hard to make sure that the infrastructure and services are in place to support faculty and students, so the results are recognition of all that work! What makes a class engaging and worthwhile? Is it the subject matter? Is it the teacher alone? Or is this an equal responsibility of students as well. Let us consider just how the students can help create an interesting atmosphere, conducive to learning and fun in their classrooms. We always consider the power a teacher has in a classroom, for example, their influence on setting the tone of a class. However, we rarely consider the power of the students. A classroom is filled with tens of students while there is generally only one teacher. If all of the students are engaged in learning, the class will be great. On the other hand, if only the teachers are willing to engage themselves in a particular class, the class won't be worthwhile no matter how hard the teacher tries. Students have just as much an effect on the tone of a classroom as teachers whether they realize it or not. Usually, students spend a lot of time complaining about our teachers and not enough time reflecting on our behaviors as students. Teachers can only guide; students are the ones who must make the effort to learn. Teachers’ job is not just to teach, it is to help their students learn. A professor can teach all day but if their students don't pay attention then nothing is gained from their efforts. If students engage themselves in the classroom, I believe they will find that professors are actually quite wonderful at their jobs. Teachers are more engaged in classes with students that are excited about both the subject matter they are learning and teaching itself. While so much attention is placed on how teachers can motivate their students, students also have the power to motivate their teachers helping them become even better educators. So the next time you have a class, I suggest you engage yourself in the class and communicate your excitement about class to your professor. This may help to enrich the overall experience of learning. Job openings for this week: Warid Telecom requires fresh graduates for the posts of Customer Service Officers. Publicis(Add Agency) requires graduates (Marketing background) for the posts of Client Service Officers. Lahore School students at the City Campus want to know more about the Main Campus, facilities, and curricular and co-curricular activities there. Most of the students are already looking forward to joining the Main campus when they finish their courses at the City Campus. This thinking is not just based upon the facilities and environment in the Main campus alone, “but on the majors offered there,” says Haider, student of BBA. Entering a higher institution has always been a big event in the life of students. Informed students take the decision and choose institution for higher education keeping in view the programs, services, facilities and related support, which foster education and individual growth. 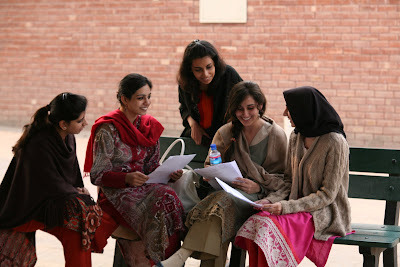 “The existing environment of the Main Campus in which students can grow and participate in meaningful academic, social and work activities that contribute to the better learning are some of the reasons due to which I am looking forward to join there,” was a collective answer of the BBA students when asked.